We've produced prototype designs and have iterated those following user research, including a static prototype with track changes between manuals on different dates. It's worth reiterating that GDS will not be rewriting the manuals when they move to GOV.UK. We also won't be archiving them. Although some users have worried that they'll be forced to print off the manuals before they're lost forever, that won't be necessary. 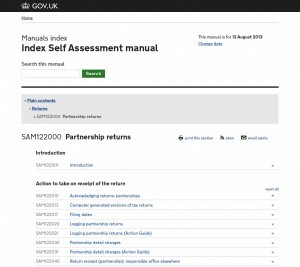 The manuals will move to GOV.UK into a format that's easier to search, easier to browse, easier to view and easier to print. The manuals are unusual content for a public site like GOV.UK. They are HMRC’s internal guidance for staff and are published externally for taxpayers and their advisors in accordance with the Freedom of Information Act 2000. Some text in the manuals is withheld from publication because of exemptions in the Freedom of Information Act. The current publishing system is not ideal and there is an enormous appetite within HMRC to improve this system for HMRC staff who are editing and using the manuals, and taxpayers and their advisors outside HMRC who are also using the manuals. Due to the unusual nature of the manuals being both internal content and public content, the work on building the new system will sit partly with the HMRC internal intranet project, and partly with the GOV.UK team. HMRC is looking at building a new publishing process for the manuals as part of a wider project to update the HMRC intranet. The idea is for the HMRC intranet to automatically push (under the control of an HMRC editor) the public versions of the manuals out to GOV.UK. GDS is planning to build a new front-end application on GOV.UK which will receive the public versions of the manuals from the HMRC intranet and display those manuals to public users. The alpha front-end application on GOV.UK will be built by the new specialist team within GOV.UK led by Neil Williams. A second team in GOV.UK will then deliver the integration with the backend publishing system on the HMRC internal intranet. We are hoping to be able to release a public beta of the new HMRC manuals system in the summer. The beta service will not be a complete service and will not include all of the manuals, but it will give you a chance to try out the new service on a few example manuals and give us feedback to make it better. You can find out more about what it means for a service to be in beta on the design notes blog and in the Service Design Manual. You'll still be able to access the existing manuals on www.hmrc.gov.uk until the new manuals system is fully tested and meets user needs. You should continue to use and link to the old manuals as you currently do. When the new system is ready to receive the manuals we will start the process of transitioning each manual into the new system. When we move each manual to GOV.UK, HMRC will automatically redirect users from the old version on www.hmrc.gov.uk, so you'll not lose any of your links or references. We'll be blogging more about the process of moving each manual into the new system nearer the time. This won't happen until the public beta of the system has been fully tested. GOV.UK sites have a clean structure and are visually appealing. As such HMRC site contains a lot of information: general information, manuals, notices etc. It would help if the new site clearly differentiates that part of the site which has legal force e.g. VAT notices.